In the aftermath of the 2016 election, when the specter of alleged collusion between Donald Trump’s campaign and Vladimir Putin’s government first gained a foothold in the headlines, many on the American left decried the story as a nefarious distraction. In their view, if the Democrats’ sudden fixation on the Russian menace didn’t birth a new Cold War, it would at least snuff out a much-needed conversation about the inadequacies of Hillary Clinton’s economic platform. Some progressives begged to differ. Sure, they conceded, the “Trump-Russia” scandal could be used as a means of rationalizing the expansion of NATO, or establishing the irrelevance of policy to the Democrats’ electoral woes. But it could also be used to tell other stories — stories about the hazards of the American real-estate industry’s complicity in money laundering; or about how Trump’s mercenary and amoral approach to foreign affairs was only a more garish version of the military-industrial complex’s; or about the threat that a transnational class of reactionary plutocrats posed to democracy the world over. The ensuing journalistic and FBI investigations of the Trump campaign bolstered that last narrative, by revealing that Russia wasn’t the only authoritarian petro-state with unseemly ties to the new president. Meanwhile, Trump’s failure to maintain the pretenses necessary for legitimizing key pillars of the bipartisan consensus on foreign policy — his refusal to feign concern over our favorite autocrats’ human rights abuses, and insistence on defending American interventions in the Middle East on the grounds that they’re good for arms sales (if not, for neocolonial resource extraction) — opened the door to a progressive critique of “the blob’s” conventional wisdom. And Bernie Sanders walked right through it. … Those of us who believe in democracy, who believe that a government must be accountable to its people and not the other way around, must understand the scope of this challenge if we are to confront it effectively. 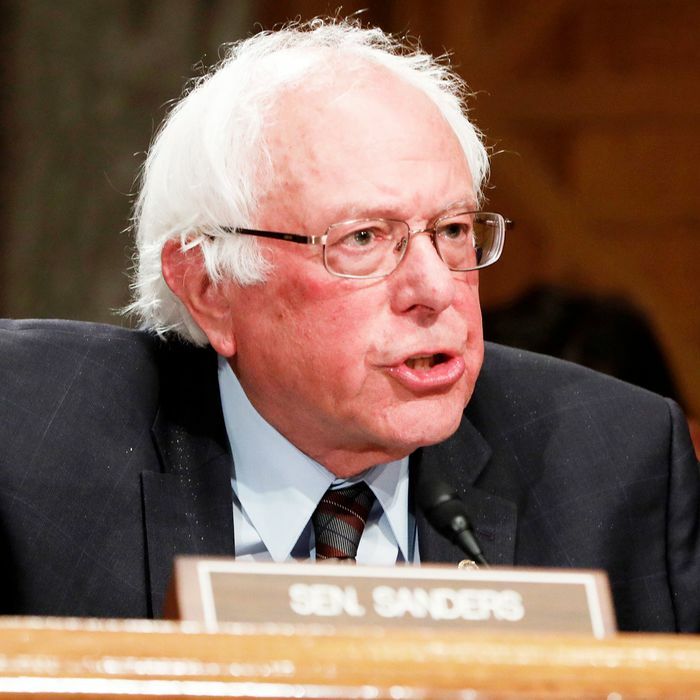 Sanders argued that the U.S. government could meet this challenge by, among other things, developing a foreign policy that prioritizes the promotion of labor rights, the elimination of tax havens, and a global reduction in arms spending. In the weeks since that address, the Trump administration’s grotesque indifference to Saudi Arabia’s apparent assassination of Jamal Khashoggi has buttressed Sanders’s narrative, while further undermining the established consensus about U.S. policy in the Middle East. On Wednesday night, Sanders used the latter development as an opportunity to give his foreign policy vision more concrete expression. In an op-ed for the New York Times, the senator wrote that Khashoggi’s death “underscores how urgent it has become for the United States to redefine our relationship with Saudi Arabia, and to show that the Saudis do not have a blank check to continue violating human rights.” To that end, Sanders renewed his call for the United States to withdraw its support for Riyadh’s bloody intervention in the Yemeni civil war. The case against that genocidal enterprise is not difficult to make. But Sanders offers a strong rendition of it — indicting the war not merely in moral terms, but in strategic and Constitutional ones as well. Sanders notes that more than 30 percent of the Saudis’ bombing targets in Yemen have been nonmilitary assets; that the rate of civilian deaths is only accelerating; that the devastation wrought by the Saudi-led campaign has put Yemen on the cusp of a historically severe famine; and that Mike Pompeo overruled his own State Department staffers when he certified that the Saudis were making “every effort to reduce the risk of civilian casualties” — and that Pompeo reportedly issued this assessment out of a desire to protect American arms deals with Riyadh. The administration defends our engagement in Yemen by overstating Iranian support for the Houthi rebels. But the fact is that the relationship between Iran and the Houthis has only strengthened with the intensification of the war. The war is creating the very problem the administration claims to want to solve. Above and beyond the catastrophe that this war has created, there is the fact that American engagement there has not been authorized by Congress, and is therefore unconstitutional. Article I of the Constitution clearly states that it is Congress, not the president, that has the power to declare war. Over many years, Congress has allowed that power to ebb. That must change. Throughout his long-shot presidential bid in 2016, Sanders had conspicuously little to say on foreign policy. His campaign’s animating ambition was to revise the terms of the Democratic Party’s debate over domestic, economic issues. That ambition is now fulfilled. Contrary to the fears of some left-wing critics of the Trump-Russia investigation, the Democratic Party’s top 2020 contenders have (almost universally) adopted Sanders’s social democratic vision for domestic policy, endorsing a wide variety of robustly redistributive social programs. Sanders’s success on this front (combined with his advanced age and white maleness) threatened to rob him of a rationale for mounting another run at the White House in 2020. His pivot to foreign policy could solve that problem. Whether the Democratic Party needs a septuagenarian socialist as its standard-bearer — when it has a large bench of (at least superficially) appealing progressive candidates to choose from — remains more than debatable. But there is no question that the United States needs a new, progressive vision for its approach to geopolitics. And, for the moment, Sanders appears to be the only 2020 hopeful who’s interested in providing one.